The dining scene in Lake Wylie just continues to get better and better. The demand for more options and gourmet offerings continues to grow, and now even more fantastic food and great beer are coming to Lake Wylie. A confirmed opening date is still to be determined, but plans for Copper Premium Pub are in the works for an August opening. The former site of Café 49 at 4516 Charlotte Highway will soon be the new location for this exciting pub opening. The site has been under construction for many months, with a focus on expanding the outdoor seating area so diners can maximize warm weather dining. Copper Premium Pub is bringing the long awaited top notch pub experience to Lake Wylie. The focus of the establishment is on a family friendly environment aimed at serving great food and drinks “artfully crafted by hand” by a professional staff with service that cannot be beat. There will be 30 craft beers on tap and a fantastic food menu offering a fun casual dining experience for the whole family. The restaurant will be open daily, from 11 AM to 11 PM Sunday through Thursday, and from 11 AM to midnight on Friday and Saturday. 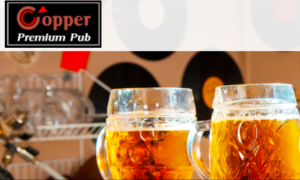 The menu is still in the works, however, be sure to check in to their website for updates at copperpremiumpub.com. You can also visit their Facebook page here for updates and information.